Mervyn Hannan was born in Melbourne, 1954. He grew up among artists’ and writers at the Montsalvat Artists’ Colony in Eltham, Victoria. A natural artist, Mervyn has travelled much of his adult life making art. From 1977 – 1982 he travelled across Europe, Asia, Africa and the United Stated absorbing the arts, music and cultures of new places. From 1977 – 1982 he worked at the Montreux Jazz Festival Switzerland as stage hand with some of the worlds leading jazz musicians. Much of his sculptural work has an ephemeral dimension. Works have been made in bush or unexpected locations and left to return to their natural environment. His work includes obscure placement of stones juxtaposed with found bush debris and often, with the inclusion of a made object found on the location to give an ‘out of context’ dimension to the work. Many of the works have not been recorded, due to the permeance of otherwise ephemeral pieces. His visual arts works are made using multi-media processes from traditional paint on canvas, drawing, pastel painting, carving construction and clay modelling. A founding member of the ‘Ice-Breakers’ band, he plays the drums and percussion. His work is held in private collection internationally and throughout Australia and remnants of ephemeral pieces can be found unusual locations throughout the world. 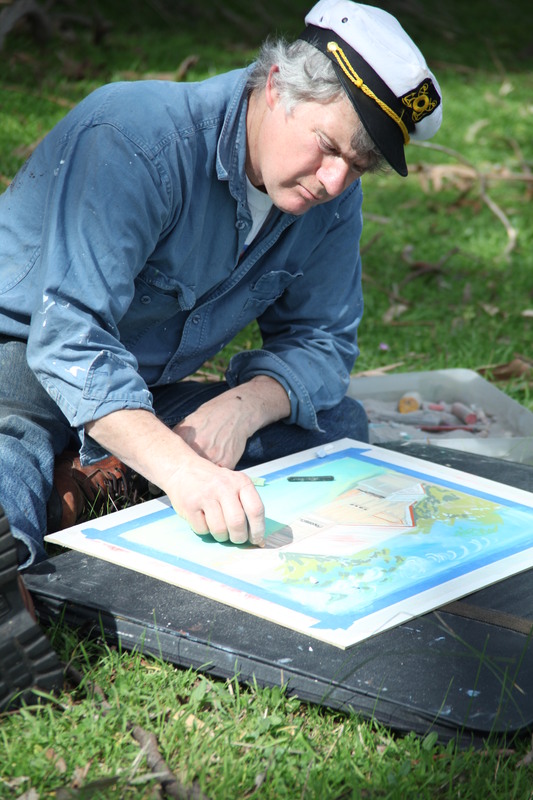 Mervyn has returned to his home Eltham and shares a studio with Jenni Mitchell at Montsalvat where some of his work can be viewed or by appointment at his Eltham Studio and Gallery, Eltham South Fine Art. 1998 Liza Taylor Sculpture Gallery – Mt. Macedonm Vic.